Want to know how your small business can become online friendly? Our “Building an Email List” series is designed to guide your organization through the use of email marketing for building your brand reputation, following up with leads, and growing your customer base. Straightforward advice ahead! With all the hubbub over social media and their ability to reach customers, many assume that email marketing is being replaced, or at least becoming a less effective marketing tool. But this actually isn’t the case. In fact, many small businesses have found that email marketing is becoming an even more powerful way to build relationships. In this post, we’ll explain five reasons why you should incorporate email into your small business marketing toolkit. Maybe this will sound familiar to you: your clients come to you at a time when they have a specific problem, but they don’t think about you when things are running smoothly. You only come to mind when there’s something wrong or a disaster’s happening. In this scenario, you may not have opportunities to engage with them to show what your company is all about. An email newsletter lets you keep in touch with people so they remember that you’re around, you’re still good at what you do (and getting better), and you have new products and services. It might even spur people to buy something they hadn’t considered before. Email doesn’t only tell people what you’re doing, but by the act of sending out an email to them means that you want to find solutions to their problems, you want to know what challenges they face, and how you can do business with them. One of the problems with marketing luxury goods is that not everyone can afford to spend thousands of dollars on an item at any given time, or during every period of their lives. For instance, someone starting out in their career may not be able to buy your luxury product, but they’re interested in your product and identify with its culture. An email newsletter can be a good way to keep their interest until they’re able to become a customer. Email is more personal than a website that anyone can access. This allows an email message to be more exclusive and give recipients the feeling that they’re on the inside track or getting something that isn’t available to the wider public. For instance, you can use email to make special announcements, or to let people know about exclusive deals they wouldn’t know about had they just visited your website. You can’t rely on people to be subscribed to the same social network where your message is being broadcast. A specific social network like Twitter may simply not appeal to the client you’re trying to reach. Or worse: people shun specific social networks like Facebook, which many have moved away from because of growing privacy concerns or (as Douglas Rushkoff argues) out of fear that our information is being used against us. And yet, chances are that even If you shun social networks, you’ll still have a personal email address or be given an email address by your workplace. The email address is about as ubiquitous the phone number. And people are often more likely to give it to you than their phone number. While you can’t count on your message on those networks reaching your intended audience, in a lot of ways, email is the common denominator. Do you use email marketing or are planning to start? Please let us know in the comments why you think it’s a good idea. 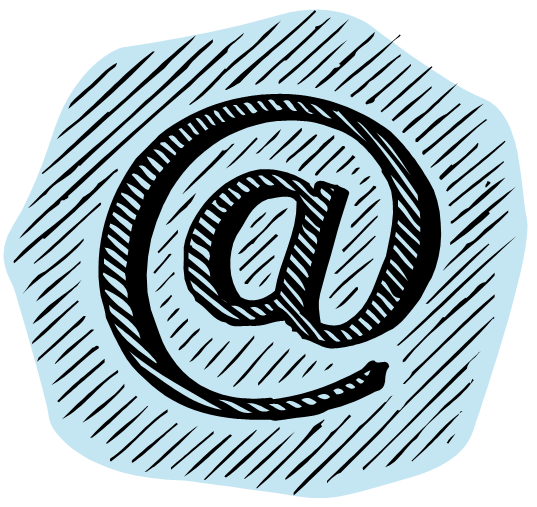 And please feel free to contact us if you need some help getting started with email marketing.